The first significant word here, “virtue,” is the translation of the Greek arete (ar-et'-ay), Strong’s #703; meaning excellence, both intrinsic and attributed. Intrinsic means something is excellent by its own very nature and attributed means a characteristic or an attribute is assigned to something by interpretation. The	Greek word translated “virtue” in the KJV, is translated “excellent” in the NIV and is “excellence” in the NASB translation. Hence, it seems these last two mentioned interpretations are more connected to Strong’s definition. Yahweh, Who at sundry times and in divers manners spake in time past unto the fathers by the prophets, hath in these last days spoken unto us by His Son, Whom He hath appointed heir of all things, by Whom also He made the worlds; Who being the brightness of His glory, and the express image of His person, and upholding all things by the word of His power, when He had by Himself purged our sins, sat down on the right hand of the Majesty on High; being made so much better than the angels, as He hath by inheritance obtained a more excellent name than they. For unto which of the angels said He at any time, Thou art My Son, this day have I begotten Thee? And again, I will be to Him a Father, and He shall be to Me a Son? So, Yahshua’s name is an excellent name in and by itself. Let them praise the name of Yahweh: for His name alone is excellent; His glory is above the earth and heaven, Ps. 148:13. This verse further clarifies that Yahweh’s name is excellent in and by itself. What is said to have an attribute or has excellence by interpretation? How excellent is Thy lovingkindness, O Elohim! Therefore the children of men put their trust under the shadow of Thy wings. According as His divine power hath given unto us all things that pertain unto life and righteousness, through the knowledge of Him that hath called us to glory and virtue: whereby are given unto us exceeding great and precious promises: that by these ye might be partakers of the divine nature, having escaped the corruption that is in the world through lust. And beside this, giving all diligence, add to your faith virtue; and to virtue knowledge; and to knowledge temperance; and to temperance patience; and to patience godliness; and to godliness brotherly kindness; and to brotherly kindness charity. Each of these eight characteristics is not a separate entity by itself. Each is used to develop the next one. Faith (assurance in our beliefs) is used to develop virtue (assurance something is of excellence), which is used to develop knowledge (information), which is used to develop temperance (self-control), which is used to develop patience (cheerful endurance), which is used to develop piety (devoutness), which is used to develop brotherly kindness (philadelpia – love of the brethren), which is used to develop charity (aga’-pe love which is the ultimate of all feelings one can have towards mankind). The second word, “praise,” is the translation of the Greek epainos (ep'-ahee-nos) Strong’s #1868; meaning laudation or to sing or give praise or extol. Saying, what said, Master, that I may receive my sight. And Yahshua said unto him, receive thy sight: thy faith hath saved thee. And immediately he received his sight, and followed Him, glorifying Yahweh: and all the people, when they saw it, gave praise unto Yahweh. One should note here that all the people gave praise to Yahweh. And as they were loosing the colt, the owners thereof said unto them, why loose ye the colt? And they said, the Master hath need of him. And they brought him to Yahshua: and they cast their garments upon the colt, and they set Yahshua thereon. And as He went, they spread their clothes in the way. And when He was come nigh, even now at the descent of the Mount of Olives, the whole multitude of the disciples began to rejoice and praise Yahweh with a loud voice for all the mighty works that they had seen. Third is a story which indicates that we should render honor and glory towards Yahweh through praise. Now I say that Yahshua Messiah was a minister of the circumcision for the truth of Yahweh, to confirm the promises made unto the fathers: and that the gentiles might glorify Yahweh for His mercy; as it is written, for this cause I will confess to thee among the gentiles, and sing unto Thy name. And again he saith, rejoice, ye gentiles, with His people. And again, praise Yahweh, all ye gentiles; and laud Him, all ye people, Rom. 15:8-11. But we see Yahshua, Who was made a little lower than the angels for the suffering of death, crowned with glory and honour; that He by the grace of Yahweh should taste death for every man. For it became Him, for Whom are all things, and by Whom are all things, in bringing many sons unto glory, to make the Captain of their salvation perfect through sufferings. For both He that sanctifieth and they who are sanctified are all of one: for which cause He is not ashamed to call them brethren, saying, I will declare Thy name unto My brethren, in the midst of the assembly will I sing praise unto Thee. 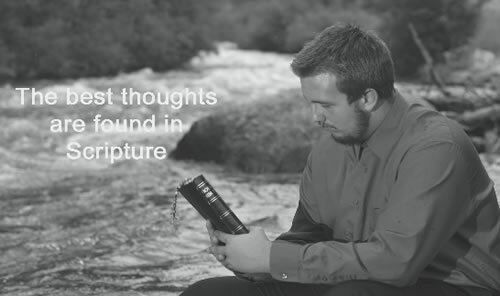 Now, let’s look at Philippians 4:8, in its entirety, to find out what the phrase “think on these things,” includes. Finally, brethren, whatsoever things are true, whatsoever things are honest, whatsoever things are just, whatsoever things are pure, whatsoever things are lovely, whatsoever things are of good report; if there be any virtue, and if there be any praise, think on these things, Philippians 4:8. Finally, brethren, if there be any virtue, and there be any praise, then think on whatsoever things are true, whatsoever things are honest, whatsoever things are just, whatsoever things are pure, whatsoever things are lovely, and whatsoever things are of good report, Philippians 4:8. If there be any excellence, and if there be any praise, then think on whatsoever things are true, whatsoever things are honest, whatsoever things are just, whatsoever things are pure, whatsoever things are lovely, and whatsoever things are of good report, Philippians 4:8. Knowing that Yahweh’s word is true (“Thy word is truth,” John 17:17), this entire verse is likewise true. It has been shown that the hypothesis is true and the logic statement itself is true. Hence, the conclusion must likewise be true. Now what are we to think about? What we shall now do is look at how Scripture uses these key words as our own interpretation might fall short. This word “true” is the translation of the Greek alethes (al-ay-thace'), Strong’s #227, which basically means sincere, genuine, and not fake. Let us find some examples. Therefore let us keep the feast, not with old leaven, neither with the leaven of malice and wickedness; but with the unleavened bread of sincerity and truth, 1 Cor. 5:8. Unleavened bread is emblematic of purity and in this case sincerity means our thoughts and actions, which are to be true, are to be without any hidden agenda. He that cometh from above is above all: he that is of the earth is earthly, and speaketh of the earth: He that cometh from heaven is above all. And what He hath seen and heard, that He testifieth; and no man receiveth His testimony. He that hath received His testimony hath set to His seal that Yahweh is true. Then cried Yahshua in the temple as He taught, saying, ye both know Me, and ye know whence I am: and I am not come of Myself, but He (Yahweh) that sent Me is true, Whom (speaking of Yahweh) ye know not. I have many things to say and to judge of you: but He (Yahweh) that sent Me is true; and I speak to the world those things which I have heard of Him. And they sent out unto him their disciples with the Herodians, saying, Master, we know that Thou art true, and teachest the way of Yahweh in truth, neither carest Thou for any man: for Thou regardest not the person of men. For My flesh is meat indeed, and My blood is drink indeed. He that eateth My flesh, and drinketh My blood, dwelleth in Me, and I in him. As the living Father hath sent Me, and I live by the Father: so he that eateth Me, even he shall live by Me. This is that bread which came down from heaven: not as your fathers did eat manna, and are dead: he that eateth of this bread shall live for ever. The word “indeed” in verse 55 is meaningful. It is the translation of the Greek aleethees. Aleeethees, the adjective form of the noun alethes, was translated as “true” earlier. For my flesh is the true meat, and My blood is the true drink. This word “honest” is the translation of the Greek semnos (sem-nos'), Strong’s #4586, meaning venerable, i.e. honorable. It is de-ived from from Strong’s #4576, which means to revere, i.e., adore. One can use this to modify "things" in Phil. 4:8 to mean "dignified" or "causing respect," relative to what we say, do and wear. I exhort therefore, that, first of all, supplications, prayers, intercessions, and giving of thanks, be made for all men; for kings, and for all that are in authority; that we may lead a quiet and peaceable life in all righteousness and honesty. First of all, then, I urge that entreaties and prayers, petitions and thanksgivings, be made on behalf of all men, for kings and all who are in authority, so that we may lead a tranquil and quiet life in all righteousness and dignity. The American Standard Version and the Darby Bible uses gravity. The Complete Jewish Bible uses upright in everything. The Revised Standard Version uses respectful in every way. We can see what a variety of meanings that “thinking on things which are honest” really involves. The word “just” is the translation of the Greek Strong’s #1342 dikaios (dik'-ah-yos) from Strong’s #1349; equitable (fairness, in character or act); by implication, innocent, holy (absolutely or relatively). In general, this word is used of people relative to the execution of things which are considered right (or righteous), absolutely when that person is Yahweh or Yahshua, where it signifies a perfect agreement between their nature and their acts, and relatively, when that person is man. I can of Mine own self do nothing: as I hear, I judge: and My judgment is just; because I seek not Mine own will, but the will of the Father Who hath sent Me. Yes, Yahshua’s judgment is just (justified), is righteous. And one Ananias, a devout man according to the law, having a good report of all the Jews which dwelt there, came unto me, and stood, and said unto me, brother Saul, receive thy sight. And the same hour I looked up upon him. And he said, the Elohim of our fathers hath chosen thee, that thou shouldest know His will, and see that Just One, and shouldest hear the voice of His mouth. The NIV Bible uses righteous one in place of just one – same meaning. Here again the NIV Bible uses righteous in place of just. For it is not those who hear the law who are righteous in Yahweh's sight, but it is those who obey the law who will be declared righteous. The KJV uses “just” here in place of righteous. This verse definitely spells out what our thoughts must be directed towards - things which are declared just (or righteous). We are to be scriptural law abiding people. The word “pure” comes from the Greek hagnos (hag-nos') Strong’s #:53; from the same as Strong’s #40; properly, clean, i.e., (figuratively) innocent, modest, perfect, chaste, freedom from defilements or impurities. See that what you have heard from the beginning remains in you. If it does, you also will remain in the Son and in the Father. And this is what He promised us — even eter-al life. To remain in Him we must be obedient . In 1 John 2:28 NIV, we are spoken of as children of Yahweh. In the life we now lead, we must have this hope of living again. This will help us to remain in Yahweh’s favor. To remain true we must remain obedient. But we know that when He appears, we shall be like Him, for we shall see Him as He is. Everyone who has this hope in Him purifies himself, just as He is pure, 1 John 3:2b-3 NIV. Draw nigh to Yahweh, and He will draw nigh to you. Cleanse your hands, ye sinners; and purify your hearts, ye double minded. The word “purify” is the translation of the Greek hagnizo (hag-nid'-zo) Strong’s #48; from Strong’s #53; to make clean, i.e. (figurative-y) sanctify (ceremonially or morally). Our thoughts are those which will help make us clean. The word “lovely” is the translation of the Greek prosphiles (pros-fee-lace') Strong’s #4375; from a presumed compound of Strong’s #4314 and Strong’s #5368; friendlytowards, i.e. acceptable. Yes, most certainly we are to be friendly towards and acceptable by others. I beseech you therefore, brethren, by the mercies of Yahweh, that ye present your bodies a living sacrifice, holy, acceptable unto Yahweh, which is your reasonable service. And be not conformed to this world: but be ye transformed by the renewing of your mind, that ye may prove what is that good, and acceptable, and perfect, will of Yahweh. This phrase is the translation of the Greek euphemos (yoo'-fay-mos) Strong’s #2163 ; from Strong’s #2095 and Strong’s #5345; well spoken of, i.e. reputable. The Greek word euphemos is used only here. It is derived from Strong’s #2095 meaning "good" and from Strong’s #5345 mean-ng "fame," which is derived from the verb meaning "speak or make known." Thus, we should concentrate on things which are well-spoken of. Yes, we should think on all these things: thoughts which are 1) true, 2) honest, 3) just, 4) pure, 5) lovely and 6) of good report. 1. Let our actions be “true” towards Yahweh and mankind. 2. Let our actions be “honest” towards Yahweh and mankind. 3. Let our actions be “just” towards Yahweh and mankind. 4. Let our actions be “pure” towards Yahweh and mankind. 5. Let our actions be “lovely” towards Yahweh and mankind. 6. Let our actions be “of good report” towards Yahweh and mankind. Are you willing to display the actions necessary to obtain the gift of life eternal?